Everybody loves French fries, even if they try and avoid them like the plague. And no matter how you like them—thick, thin, crinkle cut, skin-on—there are plenty of places that serve up little sticks of golden deliciousness in Missouri. We certainly can't name them all, but here are some of our favorite places for French fries in Missouri. No self-respecting French fry lover could possibly turn down a pint of fries from the Westside Local in Kansas City. The fries are tossed in parmesan and parsley, and served with the Westside's signature ketchup, roasted garlic, aioli and/or Buffalo ranch—a perfect companion for a pint of something more liquid. You can have French fries. Or you can have hand-cut French fries smothered with pulled pork and rib meat, slathered in cheese sauce and topped with grated-to-order sharp cheddar. Mouth watering? Then dash on down to the Shaved Duck in St. Louis and get your fry fix. Mad Cow is a locally-owned quick service burger joint that slides your food over a counter in Columbia. Basically, a perfect place for French fry purists. The fries are crisp and golden on the outside, soft and steamy on the inside. They have the perfect salty, potato flavor that is perfect when paired with ketchup. Everybody knows that French fries are a natural companion for barbecue. Seriously, one without the other is just wrong. And that's why Salt + Smoke—one StL's premier barbecue joints—takes as much care with their fries as they do with their meats. The fresh potatoes are hand cut, fried golden and then tossed in garlic and herbs. 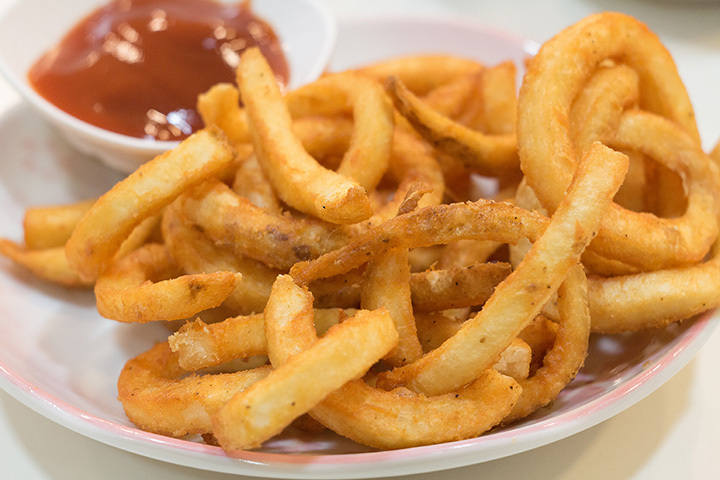 It is worth noting that the French invented French fries. And until you have eaten French-style frites, you really have no good baseline for just how good fries can be. In Kansas City, you can find the fries of which we speak at Le Fou Frog. Pop in for happy hour and grab an order of unadulterated, potato goodness to wash down with a glass of Bourdeaux. There are plenty of options for delicious fries in Springfield, but why not splurge a little and head over to Touch Oyster House and Lounge. The restaurant's salt and vinegar fries—served automatically with the fish 'n chips—will complete you. For the French frites experience in St. Louis, head over to Brasserie by Niche. Be warned, though: The dinner menu is prix fixe and frites are not always offered. Best bet? Stop in for brunch, when you can get a stand-alone order of frites. You can even get them with a fried egg. Bon appetit! The cut their French fries in house at Mojo Burger Co. in JoMo. Then they fry them to perfect, golden, potato-ey goodness that complements their renowned burgers. Like a little somethin-somethin’ on your fries? Skip the burger and just get an order of Mojo’s chili cheese fries instead. If you're looking for plank-sized, farm-to-table French fries, look no further than Mac's Local Eats in St. Louis. They are fried crisp and seasoned to perfection, adding just the right flavors to complement the soft, steamy, subtle potato flavor at the center of these French fries. Arthur Bryant's is a beloved, casual barbecue joint with a couple of Kansas City locations. And as all proper barbecue establishments should, they serve up awesome fries—some of KC's favorites. The fries are hand-cut, with skin on for flavor, and deep fried to golden perfection.